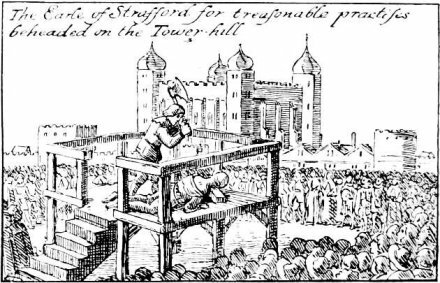 On this date in 1641, the doomed English monarch Charles I regretfully sacrificed one of his ablest ministers to the headsman. 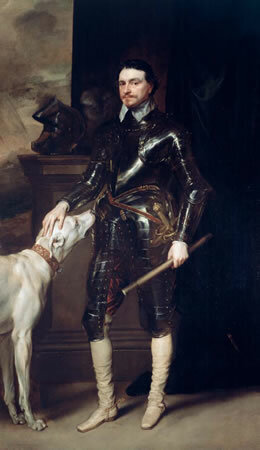 Thomas Wentworth and loyal doggie, painted c. 1639 by Anthony van Dyck. Thomas Wentworth, Earl of Strafford had cut his teeth in Parliament in the 1620s as an advocate of the rights of the Commons as against those of the king, but the notion that he’d be hoisted by his own petard would be little comfort to a King soon destined to find himself in similar straits. The authority of a king is the keystone which closeth up the arch of order and government. The authority of that king, which Wentworth now worked vigorously to uphold during the crown’s Parliament-free Personal Rule of the 1630s, also elevated Wentworth to higher honors. He would have occasion to exercise his own “personal rule” as dictatorial viceroy in Ireland, and when push came to shove between King and Commons, advocated the most tyrannical measures to compel the compliance of obstinate Englishmen. By 1640, Wentworth had become in the eyes of his enemies the very embodiment of the monarch’s every sin, and when Charles was obliged by his deteriorating situation to summon Parliament once more, its first order of business was the impeachment of this obnoxious retainer. When Wentworth skillfully repelled the charges and won acquittal on April 10, his parliamentarian opponents simply passed a bill of attainder condemning him to death anyway. The only thing that stood in the way of the chop was the signature of that ruler whom Wentworth had served so loyally. As Charles dithered — for he had personally guaranteed Wentworth his safety upon his most recent summons to London — popular hatred for the Earl threatened to escalate the crisis into something much more dangerous for the throne. In one last gesture of fealty, Wentworth dashed off a note to his sovereign, magnanimously releasing him from any obligation save political calculation. But the miscalculation was done. 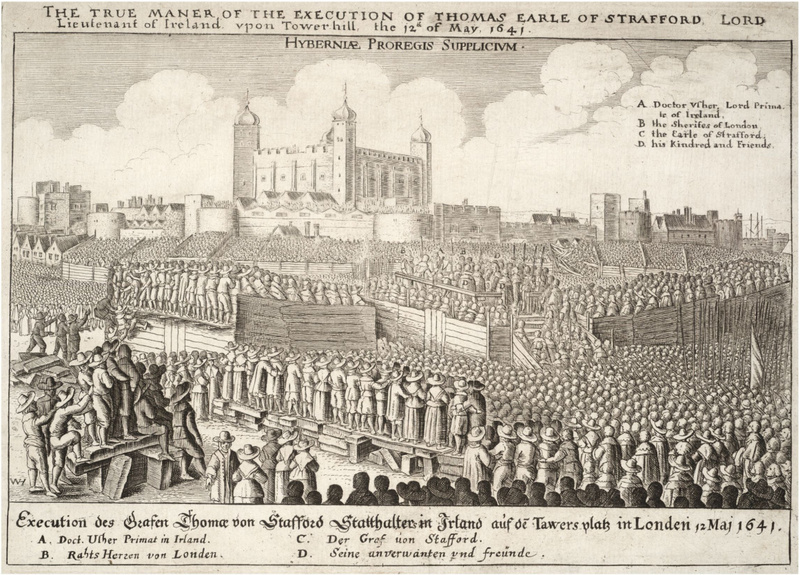 Two days after Charles signed off, Wentworth was beheaded on Tower Hill to the rapture of an audience supposed to have numbered 200,000 strong. 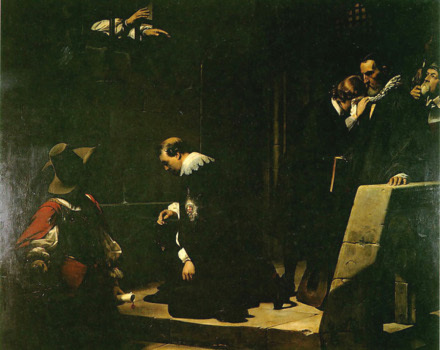 Strafford Led to Execution, by Paul Delaroche, with Thomas Wentworth, Earl of Stafford, receiving the blessing of his ally, the imprisoned Archbishop William Laud. 1642 pamphlet illustration of the beheading, from here. As things went from bad to worse for Charles in the years ahead, he would have many occasions to regret the sacrifice of so loyal and energetic a minister … and to lament, upon hearing his own death sentence, that he was suffering divine judgment for this date’s act of expedient faithlessness. * In acceding to the sentence, Charles proposed giving Strafford the best part of a week to prepare himself. Parliament ignored that request and set the execution for the very next day. 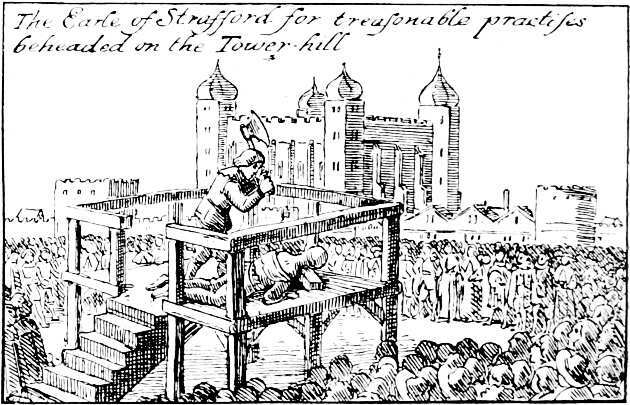 On this date in 1645, Archbishop William Laud was beheaded on Tower Hill for treason. Portrait of William Laud by Anthony Van Dyck. For this image’s subsequent life in popular circulation (and its contribution to its subject’s beheading) see Mercurius Politicus. This diminutive “martinet” made himself odious to the rising Puritan party through his rigorous (some would say narrow-minded) enforcement of so-called “High Church” dogma and decor. It was a time when believers were prepared to rend the fabric of the church over a literal fabric, the surplice worn by the clergy — among other innumerable points of doctrinal rectitude. 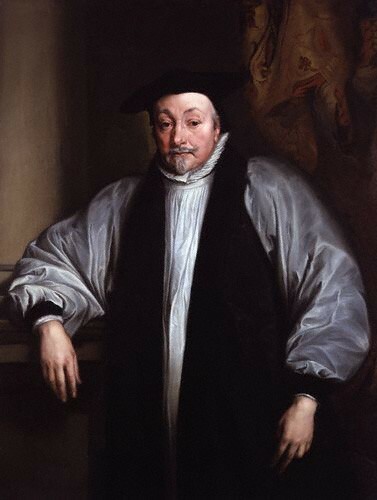 Laud’s run as Archbishop of Canterbury also happened to coincide with Charles I‘s 11-year personal rule, sans parliament. The overweening divine’s influence on secular as well as religious policy would do his sovereign no favors in the public mind. Roughly enforcing an unpopular minority position, Laud got the woodblock blogosphere in a tizzy with heavy-handed stunts like having dissenters’ ears cut off. Give great praise to the Lord, and little laud to the devil. So when Charles ran out of money and finally had to call parliament in 1640, that august representative of the nation had some business with Laud. Ironically — since the prelate was always sensitive about his height — it would involve shortening him. 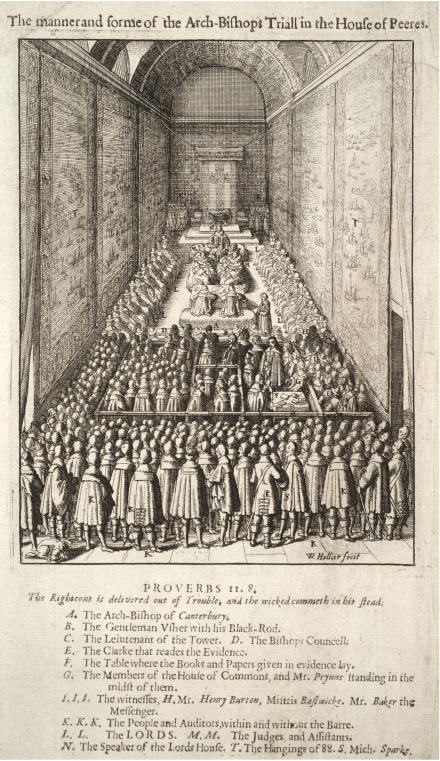 Wenceslas Hollar’s etching of William Laud’s trial. For more about Laud’s life and work, check out the detailed Britannica entry or this Google books freebie. the King’s Fool, for certain scandalous words of a high nature, spoken by him against the Lord Arch-Bishop of Canterbury his Grace … shall have his coat pulled over his head, and be discharged of the King’s service, and banished the Court.